You must make reservations at least 5 minutes in advance of the time at Vista at Arrowhead. Early bird entrees available if ordered by 6:15 pm nightly. Vail's Piano Man, Micky Poage plays 6-9 p.m. nightly. Lovely atmosphere and great service. I give the food a “B” though. We love Vista - have been every year that we stayed at Arrowhead. Micky (Pianist) is amazing and the food and service is outstanding. Was disappointed overall as service was poor & value for the cost I thought was not good. Our server was very loud & paid little attention to our table. Dinner salads were expensive & very small with little presentation. Outstanding !!! The food, atmosphere and server were all absolutely fabulous. We were two couples for dinner and we all raved about our food. I had the rack of lamb and it was perfectly cooked and was probably the best lamb I've ever had. Besides being a healthy portion, it was juicy, tender and perfectly seasoned. Likewise, others had the Tuna, Pork Chop and Trout and similarly raved about their dishes. The desserts are also amazing. They have mini-sampler versions of most desserts which allows you to choose more than one, which we all did. 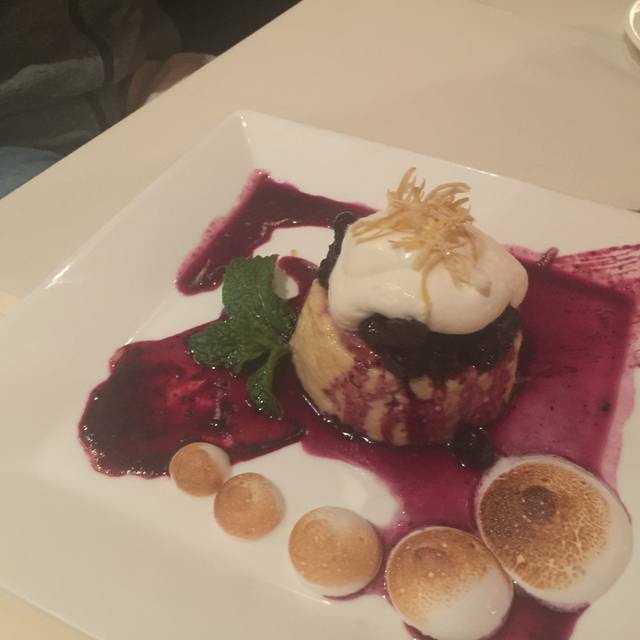 They were all great but the standout was the Lemon Carlota - if you only get one dessert, get this one. While the Person playing the piano In the bar is very good, it can be loud. If you want a quieter setting for dinner, request seating away from the bar. love Mickey. Menu and service is tops in the Edwards/Avon neighborhood. Beautiful club, wonderful scenery, excellent menu. I always forget about this gem! We had an amazing meal. The trout piccata was spectacular. 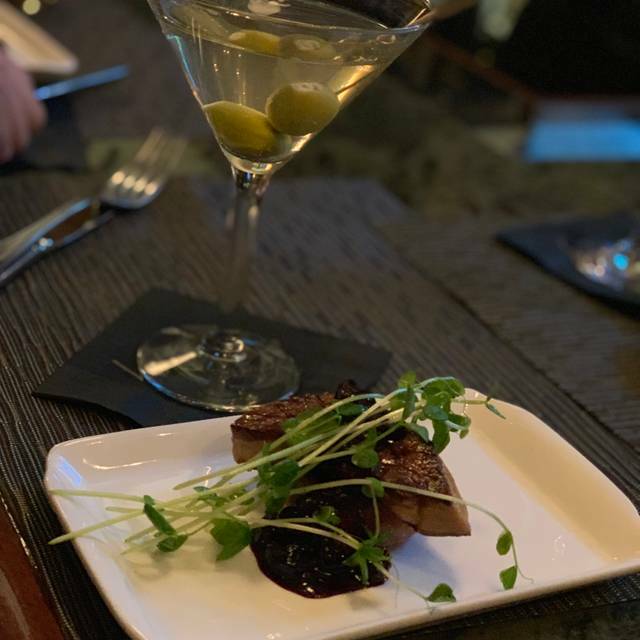 Very good martinis, excellent service and always great atmosphere, love the piano music. We will be putting this on our list of regulars. Great food and service! We could actually hear each other ! It was a busy weekend so we had to wait a little bit to be seated even with reservations. With it being so busy the restaurant was very loud. A loud obnoxious table was seated next to ours. The food was excellent! The sea scallops, chicken pot pie and pork chop were fantastic! We would definitely go again. Beautiful restaurant with great service. The food is also very good although nothing too interesting or unique. Two of us got the trout and one got the duck special, all of which were very good. Vista specializes in classic American dishes like steak, chicken and seafood prepared in straightforward conventional ways. For this, their execution is great and delicious. However, I personally like a menu with at least a few interesting options. Very good menu and food. Excellent wine list. Very good service. Excellent piano entertainment. Fantastic evening. Will definitely go again. Very good time here . Actually we have a great time consistently at Vista . Very comfortable and cozy atmosphere with excellent music provided by Mickey P. Food always excellent and service as good as it gets . Cannot say enough about this place! Food, atmosphere, wine list, service, live piano music.... So far our favorite place in the valley! Our waiter Chris was excellent, good recommendations. Loved our meal. Spectacular ambiance! We will be back! We have been here twice and enjoy it very much. This time we were disappointed in the service but not the food. Our table seemed to be a controversy as to who was our waiter and consequently it took a long time for our service even though the restaurant was not crowded. We would also like the piano bar to stay open longer. The food is always excellent and it is a lovely venu but a drive from Vail. We are local and dine here with some frequency. This particular waitress has taken care of us before and while not being great, she did not ruin the meal. This time, we took a visiting family of 5, so we had seven total and the service was horrendous. Obviously realizing she was to receive the mandatory 20% tip since we were a party of 6 or more she did the absolutely bare minimum. On every occasion she was needed we had to have some other member of the staff find her and than the assistance she provided seemed under duress, like we were keeping her from tables that could make her money. While we love the food and restaurant, I would be hesitant to visit again if I were to be subjected to her as our waitress. That is why mandatory tipping is counter productive. As always unique, special place from the valet to the hostess/host to the wait staff, everyone helpful, friendly and seeming to enjoy the job as much as we enjoy the experience of dining here. We will continue to return (and bring friend) again and again. Incredibly impeccable Food, Sevice and Setting!!! Loucie was very attentive and her recommendations were spectacular! Vista is at the top, when we are considering the very top 3 or 4 dining experiences in the Valley. Daryl the owner is great! Everything was great; food outstanding!! Waitress was a bit scrambled not sure why. We have been going to Vista at Arrowhead for several years. We experienced a poor service. We were seated in a table that was in an extension not in the main area as we experienced before. Food was not as usual. In summary, we decided not to return soon to this restaurant. Our Valentines celebration could not have been better. Great service without hovering, awesome food on point and the music by Mickie on the piano just put it over the top. Love Vistas!! Never disappoints and Micky is always wonderful year after year. Great food and great service. We enjoyed every minute of it. On vacation and wanted a nice night out. Was here last year too and enjoyed our meal/experience. Ambience is nice, piano playing is enjoyable, food is always very hood. Definitely not inexpensive, but we make sure to take advantage of the early bird 15% off entrees by placing our order before 6 PM. Great food and great staff. The bartender makes a killer spicy margarita. Loved everything about our visit to Vista! The food and service were great. I felt the food pricing was reasonable and really appreciated having a consistently full glass of water. The live music and complimentary valet parking were a nice addition to the evening. This is definitely a place that is not to be missed! Everyone had a wonderful time at Vista. All of the meals were delicious except the Schnitzel. It was so overcooked that it was almost not eatable. We enjoyed everything so much, I didn't want to say anything about my meal. Enjoyed Micky Poage's fabulous music on the piano. Food was creative, excellently prepared, and delicious. Terrific evening! Our thanks to all. A hidden gem for the Vail Valley. Hard to find but worth the effort. We are homeowners in beaver Creek and this is one of our favorite restaurants. Terrific trout picatta! Grilled trout over spinach and fettuccine pasta. Nice ambiance - sat near the fireplace on a frigid cold night so that was pleasant. Micky Poage, the pianist, was playing in the next room. Wonderful music but we asked to be a bit away from the music as we wanted to talk. Service was very good. Vista has been consistently good since Daryl took over as owner/manager. Great food, service and piano player!